Gotta find out who’s naughty, who’s nice. I found these amazing leather-bound notebooks from Smythson of Bond Street, purveyor of luxury leather goods and personalized stationery, which are perfect as stocking stuffers this Christmas. Need to jot down contact information of your favorite SA or that bespoke tailor for your next made-to-measure appointment? The Little Black Book (£41, 14x9cm.) bound in black grained lambskin with gold blocking on the cover is your dandy directory of sorts. Thinking of a gift for your girl friend whose endless shopping sprees feed the economy? 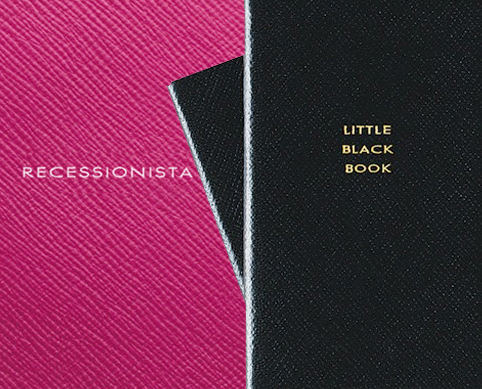 The new, lightweight Recessionista Notebook (£39, 14x9cm.) bound in supple, cross-grained lambskin will tickle her pink. Making your own shopping lists will soon be guilt-free with these encouraging Bliss List and Happiness is Shopping wafer notebooks (£29, 10.5x7cm. ), both bound in grained lambskin leather. The fuchsia leather is complemented by silver edged leaves and silver blocking, while the emerald one with gold edged leaves and gold blocking. Both come with matching satin ribbon markers. 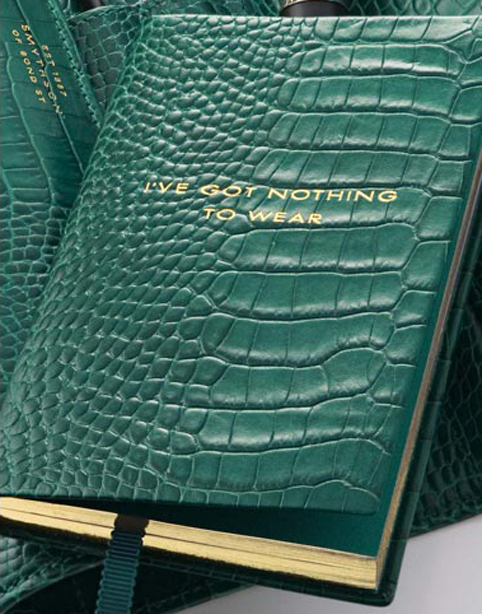 Take note of fashion inspirations, runway collections and plan your wardrobe shopping with the pocket-sized I’ve Got Nothing to Wear Notebook (£57, 14x9cm.) from the recently launched Malachite Collection, inspired by semi-precious stones and natural woodland. Did I mention the leather is croc-printed in a luxurious deep green shade? Drool. This seems to be sold out online so your best bet might be a visit to one of sixteen Smythson by Bond Street stores in the US, UK, Ireland and Hong Kong. 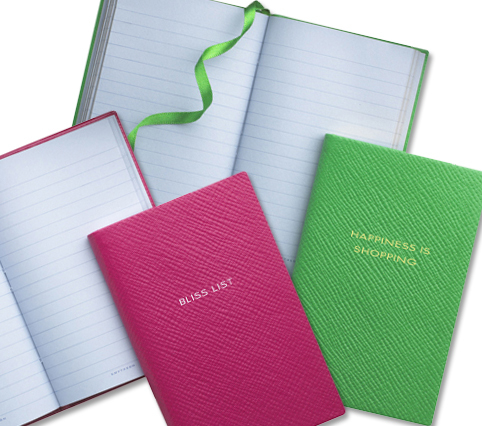 You can also personalize each notebook with stamped initials, names or symbols. The stamping is done by Smythson craftsmen on Bond Street premises, using 22 carat gold or sterling silver foils. Le sigh.